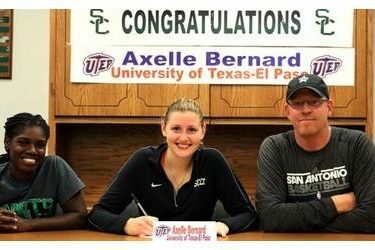 Seward County double-double machine Axelle Bernard has made her commitment for her junior and senior seasons and the University of Texas-El Paso is the choice for the Lady Saints sophomore forward. Bernard signed on Tuesday in the All-American Room at Seward County in front of teammates and supporters to make her decision official. After an All-Conference season as a rookie in 2014-2015, Bernard is off to another good start during her sophomore campaign. Through eight Seward contests, Bernard is averaging 11.5 points and 10.5 rebounds per night for the 7-1 and 8th ranked Lady Saints. She has already racked up five double-doubles in just eight games this season, giving her 13 in her Seward County career. She scored a career high 21 in Seward’s first game of the 2015-2016 season against Tabor and has a pair of 17 point performances this year. She has pulled down double digit rebounds in six of eight Lady Saint games this season including a season high 14 in a win over Gillette in the Greenhouse two weeks ago. Bernard continues the Liberal to El Paso pipeline that has been built over the past 10 years. Next season she will reunite with former Assistant Coach Kelli Willingham as well as front court partner in crime Tamara Seda with the Miners. UTEP is off to a 3-0 start in the early season with wins over Houston Baptist, Northern Arizona, and Hampton.